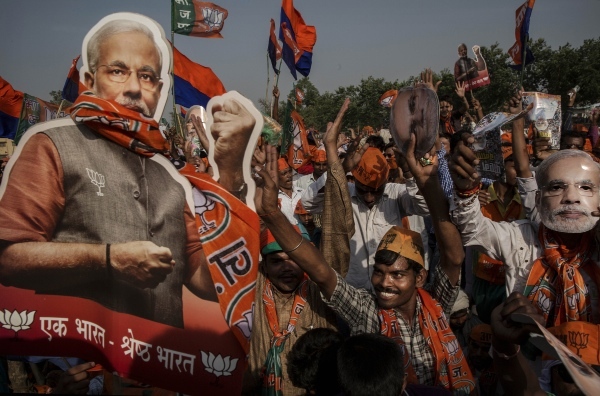 The right wing Bharatiya Janata Party has unseated the ruling Congress Party and its allies to post a resounding win in the recently concluded general elections in India. This is the first time since 1984 that a single party has won majority in India’s 543-member parliament. Since 1984, India has had coalition governments, which has sometimes slowed down reforms. The BJP, led by Narendra Modi, mounted an aggressive campaign against what they charged was “non-governance” of the ruling party. The ruling Congress Party faced the brunt of public anger over inflation, corruption charges and a slowing economy. Author Vijay Prashad says by the time the Indian electorate went to cast their ballots, they saw the Congress as “the party of corruption”. “The Congress led government fell short not only of bringing the population to the poverty line (which is very low), but it was no-where near providing an agenda for the 680 million who were below the Empowerment Line,” writes Prashad. The BJP’s campaign also received never-seen-before support from Hindu nationalist outfits like the Rashtriya Swayamsevak Sangh (RSS) whose cadres mobilized support for the right-wing party. According to late-night figures from the Indian Election Commission, the BJP-led National Democratic Alliance was leading or had won in 339 seats, with the BJP on its own at 284. The new government headed by Modi will now be sworn in next week in the Indian capital. The controversial politician has been accused of not being able to protect the lives and properties of minorities in the 2002 riots in his home state of Gujarat while he was Chief Minister. More than 1000 Muslims died in one of the worst communal carnages of independent India. Many countries, including the US and the EU had denied him visa over these charges. However, after he has decisively won the people’s mandate on Friday, many world leaders including US President Barack Obama called Modi to congratulate him and to invite him to the US.